Gecko Keck's real name is actually Gerhard Worner, a freelance graphic designer from Germany. 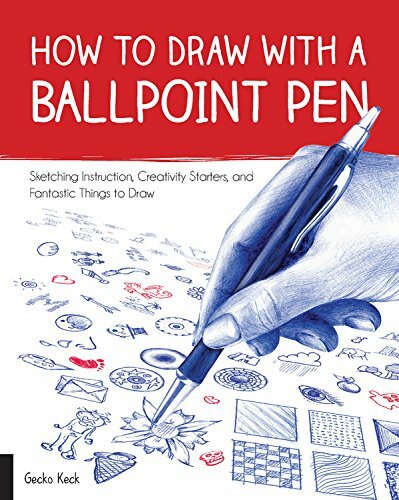 This book is actually an activity book on ballpoint drawing. It's meant for the casual artist or doodler. The book starts of with a few pages of techniques. Nothing technical, just basic demonstrations on the types of marks you can make with ballpoint, such as hatching and creating gradations. It quickly moves on to providing ideas and subject matter you can draw. For example, you may draw an animal but create a different texture of the same animal each time, draw flowers, patterns, create your own characters, draw with perspective, draw on newsprint, scribble or doodle. The book's filled with lots of fun exercises. The subject matter are lighthearted and not serious. If you're looking for something more technical, then check out Matt Rota's The Art of Ballpoint: Experimentation, Exploration, and Techniques in Ink. For inspiration, perhaps see Trent Morse's Ballpoint Art.